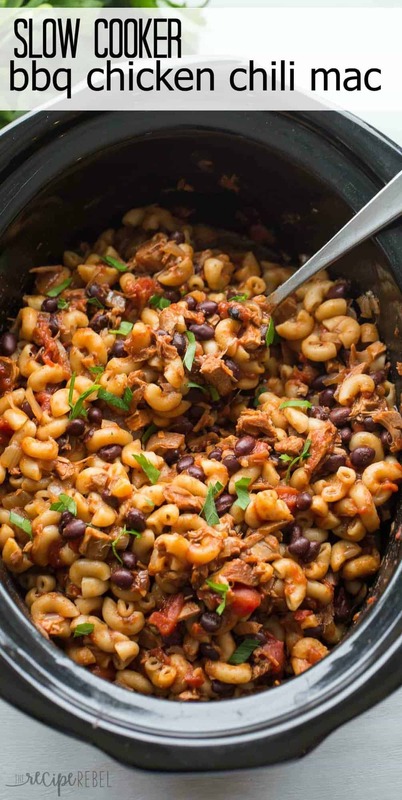 Slow Cooker BBQ Chicken Chili Mac: Crockpot Meal! 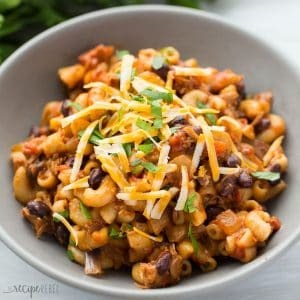 Slow Cooker BBQ Chicken Chili Mac is a hearty one pot pasta meal that cooks completely in the crockpot! You guys, I think sometimes I underestimate this whole it-being-winter thing. Can you blame me? Sometimes it feels really strange to make supper at 3:00 just so I can photograph it for the blog. And then there’s that awkward “do you try to keep it warm until it’s actually supper or do you refrigerate it and reheat it later?” issue. So I made this and, quite frankly, it was fantastic. So I had to remake it at an unnatural time of day so I could get some decent photos for you, in the hopes that you might be able to see how fantastic it was. 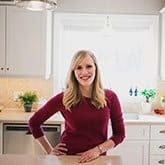 As a food blogger, I love looking to other food bloggers, and recipe sites, and cookbooks for inspiration. But I am super proud of myself when I actually think of a recipe idea that I’ve never seen before. We cooked a chicken on the weekend so that I’d have some extra chicken to use for a quick and easy meal during the week. And slow cooker = quick and easy. And we pink puffy heart quick and easy. And slow cookers. So I went to Pinterest. And I typed in “slow cooker chili mac”, and I didn’t find much. There were only a few recipes, and most added cooked pasta at the end of the cooking time. I wanted to do this without adding any extra pots. And I wanted that BBQ chicken chili flavour. And that I didn’t find anywhere. Aside from stirring in the dry pasta half an hour before eating time, this is really a dump it and forget it kind of meal. But I’ll take that over completely mushy, overcooked pasta in my chili mac any day. And I had cooked chicken, so that’s what I used. But I don’t think you’d have any problems adding raw, diced chicken to the slow cooker at the beginning of the cooking time. It will probably release more juices into the chili, so you might want to reduce the liquid just a touch or add a touch more pasta. *I have also made this with chopped turkey, and it’s just as fantastic! Add chicken, pepper, onion, beans, chili, powder, tomatoes, garlic, barbecue sauce, ketchup and chicken broth to slow cooker. Cook on low for 4-6 hours (because I used cooked chicken, the cooking time is pretty flexible -- if using raw chicken, you'll want to cook at least 6-8 hours on low). Shred or chop the chicken. Half an hour before you wish to serve, set slow cooker to high and stir in salt to taste and dry pasta. After 20-25 minutes, check to see that your pasta is cooked (if not, give it a little more time. I found that 25 minutes was perfect). Stir in cheese and serve. *I like to prep everything the night before, and just dump it in the slow cooker in the morning and turn it on. Saves a lot of time when things get crazy! **NOTE: Nutrition information is estimated and will vary depending on exact serving size, types and brands of products used. 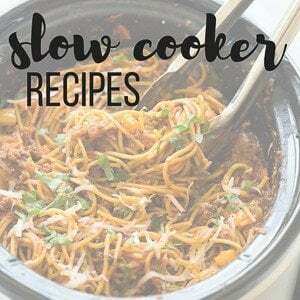 You might also like these slow cooker meals! When do you cut up the chicken breasts? Can’t find that steo. Sorry! I’ve updated the recipe. I’m wondering tho – for those of us that work and pick up the kids from the sitter – to then have to wait for the noodles to cook… 🙁 Would it work to have the noodles in from the beginning – maybe just on top? Hi Jennifer! I really wouldn’t recommend that because they would be so mushy. 20 minutes is really all you should need to cook the pasta. If you want to save some time, I would try leaving out the broth and adding completely cooked noodles right at the end, that way you could keep the cooked pasta in the fridge. I’m interested in making this! How many servings? I have a large group of people coming over this Wednesday and I’m wondering if this would be enough with side dishes! Hi Debi — sorry about that! The recipe was missing some information. I would say this would easily make 6 main dish servings. If you have a lot of side dishes or people (like children) who eat less, you might get more out of it. 6 servings would give you about 1/2 cup of chicken and 1/2 cup dry pasta per person, plus the beans and sauce and veggies. You can always double it if you need more! I made this for dinner this week and my family loved it! My 6-year-old daughter, who is sooo picky said, “Make this again!” which is a rare occurrence. 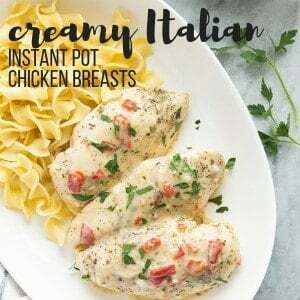 🙂 We loved the flavors and it was so quick and easy! My family loved this meal tonight. So delicious and I’m not a chili lover. Great flavour and you don’t always get that in an easy crock pot recipe. Thank you! I’m so glad you guys liked it Raegan! Haha, I definitely sampled it Alice! I think I’ve just gotten used to the weirdness of it all and I only cook lunch now. Lol. Thanks so much! What an awesome and delicious twist to classic mac & cheese! This seriously looks SO yummy and I just need a bowl full right now! Haha 😛 Pinned! Thanks Christina! Any way we get our mac and cheese is a win! Omgosh – this looks perfect! Combines so many of my favorite things too, and it looks so warm and filling! It’s a great meal all on its own – one pot! I know what you mean about taking food photos – you have to wait for the perfect window of time when the sunlight is best, and that makes for some strange cooking hours! Haha! Thanks Sarah! It was a huge hit! Oh man I’m SO there with you about having to photograph SO early in the day! I do all my photography between 9am and 10 and it seriously feels so weird making dinner so early in the morning! Not to mention the super-weird looks I get from my family! LOL. But this mac? Seriously SO freaking genius! I love that the whole thing cooks entirely in the crockpot! Anything with BBQ and mac and cheese is a winner in our house! that is one bowl of super yumminess! Isn’t the lack of light right now annoying! I keep thinking I have time to take photos of something and then suddenly it’s already dark. Oh well. This slow cooker macaroni looks so good, and I love that it’s all done in the slow cooker! It’s super frustrating! I’ve resorted to only ever cooking lunch. Lol. Thanks Stacey! Slow cooker recipe FTW! Love this perfect flavor combination! holy cow what a delicious bowl of yumminess! Haha, totally feel the same way 🙂 Sometimes I think I want to share a certain meal and then I get lazy when I think of what time I have to make it just to take a decent photo lol. 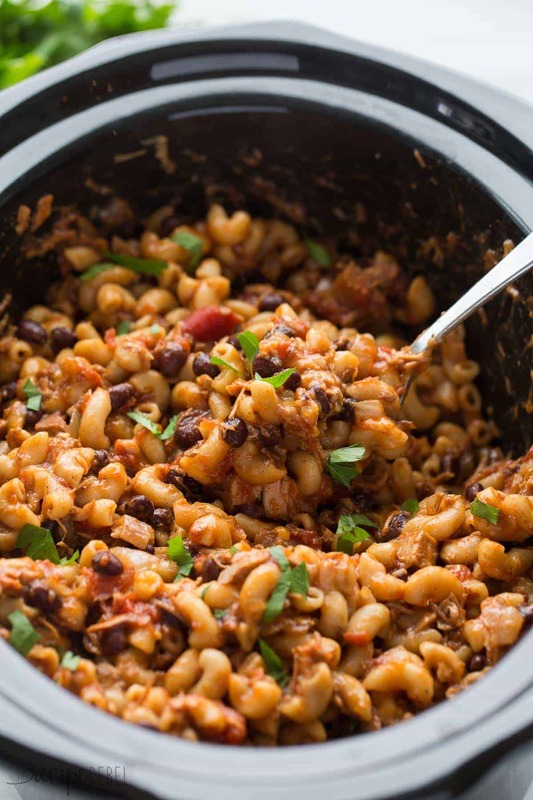 This bbq chicken chili mac is such a great idea! I love that you combined these favorite meals into one. Yay for another slow cooker winner too! It looks incredible!! I always LOVE your photography! That being said, I bet my dad would love this recipe (minus the onion since he has some weird phobia!) I always cook in the morning as well since this Canadian winter has made sure my natural light is ever-so lacking. Uh, this Canadian winter is becoming increasingly unfriendly! Thanks Kacey — it’s a labor of love! Yes, yes, yes–I feel you and the weird food timing issues. Plus, what’s worse is once I taste it, I totally want it now and not in a few hours. It’s a real test of my practically non-existent willpower. This chili, though, looks amazing. It literally encompasses three of my favorite things: mac, chili, and barbecue. Pinned! Thanks Michelle! We’ve definitely eaten at weird hours sometimes, just because we can’t resist! Lol. Yes, this looks like a winner, Ashley! Oh yes! This is so my kind of meal! I rarely think of the BBQ chicken flavor unless we are grilling so I love that you incorporated that into a delicious winter time dish! And I am so with you on the unnatural times of day! Yesterday I was standing on a ladder right in the front window, photographing dinner at 10am then I realized my neighbor was standing in his yard watching me. :/ Awkward. I’ve been doing the same thing, making dinner early in the day just so I can photograph in natural light. It feels a little weird to have to reheat dinner the first day I made it – the things we do for blogging! 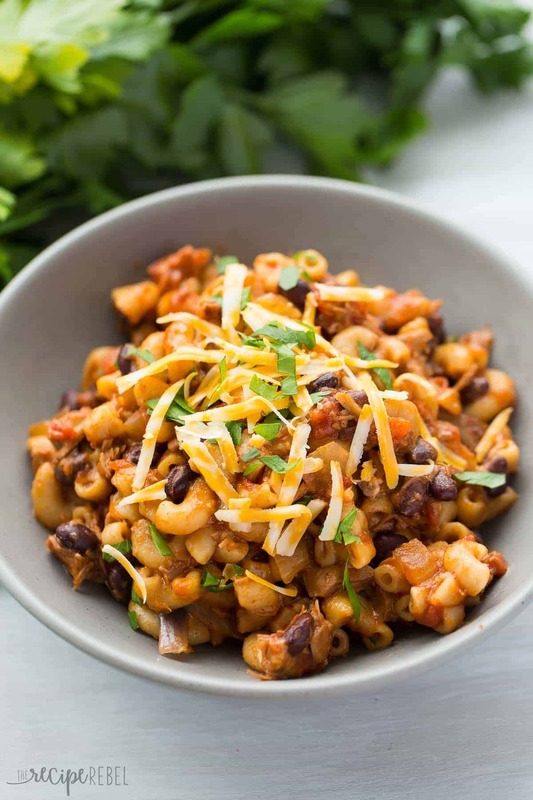 I cannot wait to make this slow cooker chili mac! I have a feeling I’m going to need lots of easy meals like this in the coming weeks, and it looks like a warm, comforting meal for a cold night! Pinned! Thanks Kristine! I hope you’re still feeling well! This looks like delicious comfort food! And I totally feel you on the sunset issue… it gets dark too quick for pictures! Chili Mac is the best thing everrrr but with bbq? Oh yeah. And PS I can totally relate to being a little too pleased with myself when I come up with a recipe idea. Go you Ashley!! Haha, there are SO many great cooks out there sharing stuff, I’m always just amazed when I search and don’t find like 25 different versions already! Thanks Karen! Love this cheesy goodness! I love one pot meals and this is just perfect for the winter. Pinned and can’t wait to try this! If I told you I was in love with this recipe would you believe me? I hope so because I’m seeing hearts in my eyes! YUM! Haha, thanks Pamela! We’re in love too! This recipe looks and sounds phenomenal! I love that it’s made in the slow cooker too! Perfect for these cold days! 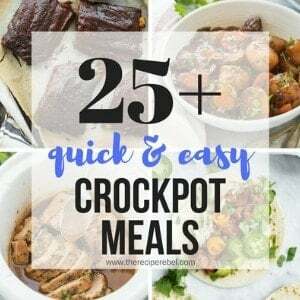 I love slow cooker meals like this! This chili mac needs to get added to our menu soon! I don’t know if you can ever go wrong with a good slow cooker meal! I totally feel the same way, Ashley! I think that’s why I focus more on baked goods, because I can make them anytime of the day. 🙂 This bbq chicken chili mac looks delicious! I love that you made this in the slow cooker. Sounds so flavorful and perfect for the winter!